Cyril Ramaphosa has to show decisive leadership. Is he just an actor in a play, the script of which he cannot write? What does he have to say about the ANC's statement in support of Ace Magashule, asks Redi Tlhabi. In response to the explosive allegations of corruption, criminality and malfeasance revealed in the much talked about new book by investigative journalist Pieter-Louis Myburgh, Gangster State: Unravelling Ace Magashule's Web of Capture, Magushule tweeted: "Our work towards electoral victory for ANC cannot be deterred by fake news, smear, and gutter journalism of papers.. The ANC will soldier on to a landslide victory. We remain unshaken and undistracted." It is to be expected, I suppose, of Magashule to obfuscate and invoke the authority of the past as a shield. In that statement, he was not even subtle about erasing himself and locating the party within this mess. Basically, he wants to convince the world that it is the party, and not him, that is being questioned and persecuted. You'd really have to be an incurable fool to fall for that. What is bizarre though, is the ANC's own manic and frantic statement in support of Magashule. Barely 24 hours after the exposé, the ANC, without having read the book exploring the paper trail of corruption and questioning Magashule himself, released a statement: "The African National Congress rejects today's vicious attack on our Secretary General, as well as the other lies, fake news and propaganda attacks that we are subjected to, with the utter contempt that these deserve. The ANC says, HANDS OFF OUR SG." This is the point at which I burst out laughing. Who on earth thinks serious and ominous accusations involving state funds, gangsterism, assassinations and looting can be brushed off with "hands off"? Anyone with half a brain can guess from whence this statement came. However, the ANC does not get to carry on like there is no stench in the air. Unless and until it issues a clear and emphatic statement articulating its position in relation to the allegations against its beloved secretary general, the statement issued in support of Magashule remains the official response and must be owned by the party. President Cyril Ramaphosa heads the party that has spent the last few months trying to convince voters that the rot of the past few years is not what the party stands for and that it was a few individuals who acted outside the ethical framework. We know this not to be true because every step of the way, the ANC supported wrong-doers, denied the extent of the damage and much of what it was asked to answer for, is being confirmed with every passing day of various commissions of inquiry. There is much that remains to be tested and confirmed, but there is no doubt that we are beyond just smelling the smoke but are now engulfed by the inferno. The fire has spread. It is visible and its blaze continues to consume every layer of our democratic edifice. We now know that it is disingenuous of the ANC to try and separate itself from the actions of its former president and his foot soldiers. Jacob Zuma was not the problem. The ANC was. And still is. Its MPs giggled in Parliament, applauded his asinine answers when asked to account and let's not forget the party's victimisation of former public protector Thuli Madonsela. The ANC stopped at nothing to usurp the authority of the public protector's office, often starting parallel inquiries that had no legal basis, all to vindicate a soiled president. It is the ANC that did that, not Zuma. And when the Nkandla matter was taken all the way to the Constitutional Court, it is the ANC that watered down the gravity of the apex court's ruling. 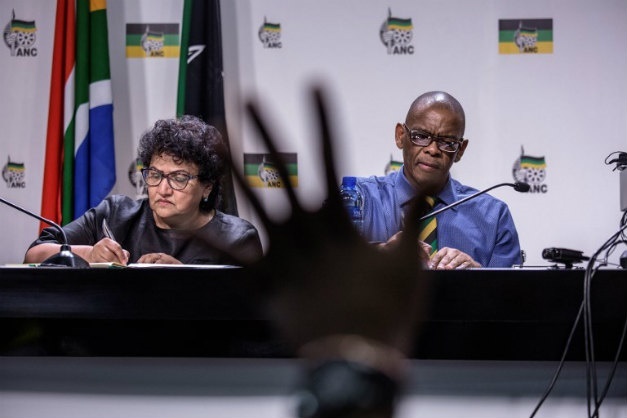 When state capture red flags were being hoisted, it is the ANC that, through its previous secretary general, Gwede Mantashe, claimed that there is no state, no party that has been captured, only a handful of people. Now that the full extent of the rot is being revealed, again the party wants to take credit for that. Before all of this, the Guptas' Waterkloof landing, using state resources and infrastructure, was dealt with like an innocuous occurrence. Again, a cohort of Cabinet ministers reported back on the issue and nobody was held accountable. There are many more examples. We are travelling towards an election that comes at a time when our nation is battered and bruised by lies, impunity, theft, corruption and a lack of accountability. It has become fashionable to regard revelations of sordid activities by office bearers, as "an attack". Even a president and ministers who are found by the courts to have violated the Constitution, have reduced any inquiries about their conduct to "attacks". Parliamentarians who breach Parliament's ethics code claim they are being "attacked". Office bearers who waste our taxes, whose departments flout rules and regulations, claim they are being "attacked". It is the age of victimhood. Ramaphosa has to rise up and show decisive leadership. Is he just an actor in a theatrical play, the script of which he cannot write? What does he have to say about the ANC's statement in support of Magashule? Does he agree with the expression of solidarity without even attempting to assess the veracity of the revelations and the paper trail and testimonies on which they are based? What does the ANC itself have to say? Is it at all going to consider and learn from its recent history? Will the party again coalesce around one of their own at the expense of our nationhood? We are not even talking about Magashule stepping down. We are not delving into the arduous journey of investigations and prosecutions. The questions before Ramaphosa and the ANC are very simple indeed; do you see the allegations and revelations against your secretary general as an "attack" on the party and will you, as you have done before, mobilise the party's machinery in his defence? Your actions or silence will tell us all we need to know. It's your move. - Redi Tlhabi is an award-winning author, journalist and talkshow host.